They wrote to the NHRC holding the central government responsible for the death of hundreds of people due to demonetisation. Ahead of the first-anniversary of demonetisation, activist brothers Tehseen and Shehzaad Poonawalla have sought a compensation of Rs 1 crore each to all victims. They wrote to the National Human Rights Commission (NHRC) holding the central government responsible for the death of hundreds of people around the country due to various disruptions caused by demonetisation. The self-immolation of a mother of four in Aligarh on 20 November, murder of a newly-wed in Odisha's Ganjam district for not paying dowry in the new notes on 29 November, death of a 32-days-old infant in the arms of the mother while waiting in a bank in Bihar's Balrampur on 2 December, murder of the van driver carrying new currencies to a bank in Assam on 16 November, were a few among the many deaths reported by medias. Cardiac arrests and stampedes while in the queues at banks caused most of the casualties. Calling the note ban an “impromptu accomplishment by the government,” the petitioners said they have decided to take the issue up because most of the victims belong to the weaker sections of the society for whom it is not easy to register any complaint, livelaw.in reported. "It is true that the families of victims of demonetisation have an impression that our legal system leaves them out in cold, it is pertinent to mention herein that people who died due to demonetisation, their families have not been compensated till date and it is therefore the duty and responsibility of this Hon’ble commission to direct the government to reach out to the families of those who lost their lives due to demonetisation and compensate them," the Poonawallas wrote to NHRC. Citing reported casualties caused due to demonetisation, the letter said, "In the days following the demonetisation, the country faced severe cash shortages with severe detrimental effects across the country. People seeking to exchange their bank notes had to stand in lengthy queues and several deaths were linked due to the rush to exchange cash. The scarcity of cash owing to demonetisation let to chaos within the society. 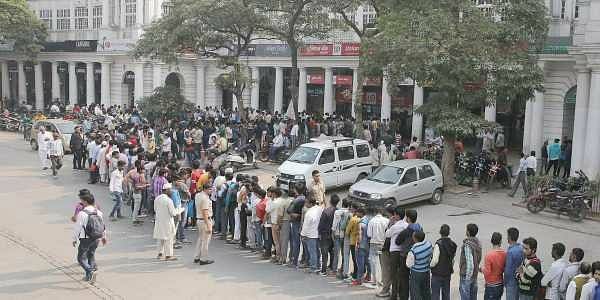 People holding old banknotes faced difficulties exchanging them due to endless queues outside banks and ATMs across India. It became daily routine for millions of people waiting to deposit or exchange the ₹500 and ₹1000 banknotes since 9 th November 2016. The ATMs across the country were running out of cash immediately after a few hours of being functional and around more than half of the ATMs within the country were non-functional. Progressive outrage and violence were reported across the country. This led to not only physical injury but also psychological. The ugly face of India’s demonetisation stemmed hundreds of deaths." They added that what followed demonetisation were contrary to the statements made by the then RBI Governor Urjit Patel and Economic Affair Secretary Shakitkanta Das, who had said that the decision was to fight black money, terrorism funded by counterfeit currency notes. However, the government was in denial of receiving any official records any "official report" on deaths due to demonetisation. Responding to a question in Lok Sabha on 17 March 2017, Minister of State for Finance Arjun Ram Meghwal had said that "no such official report has been received." The government of India had cancelled old Rs 500 and Rs 1,000 notes on November 8 2016, and the public was given time till December 2016 to exchange and deposit the defunct notes. Restrictions were also imposed on withdrawals, which were gradually removed.